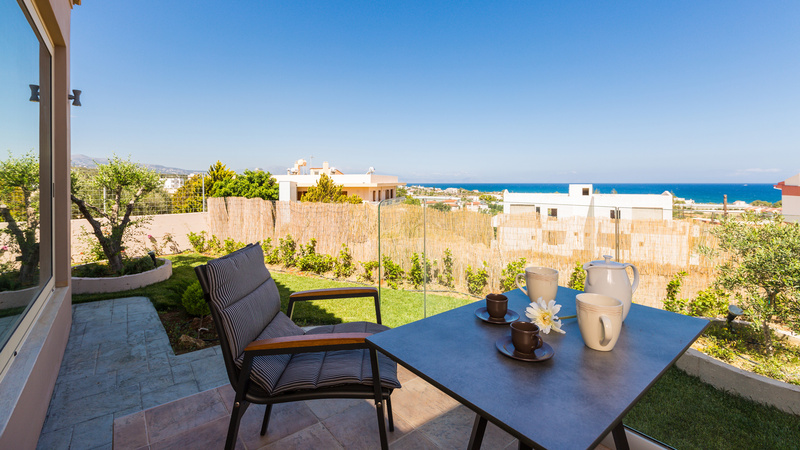 Villa Kokkinos is a private new build villa located in Sfakaki area in Rethymno and is in a walking distance from the beach and close to the city of Rethymno. 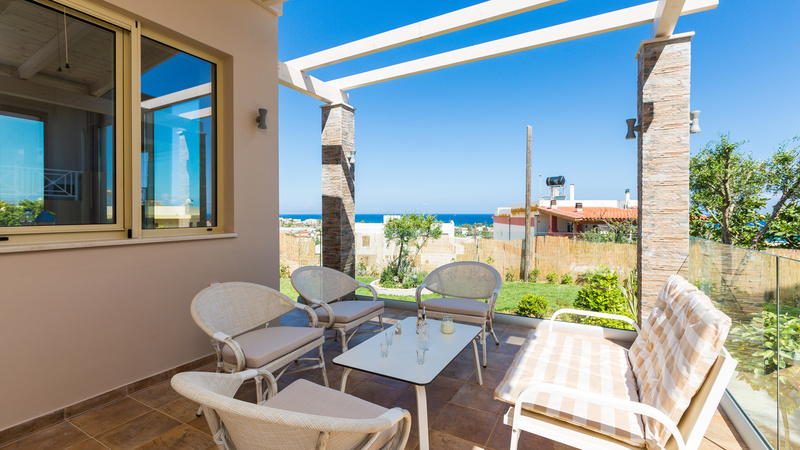 It is a fully equipped villa for relaxing holidays! 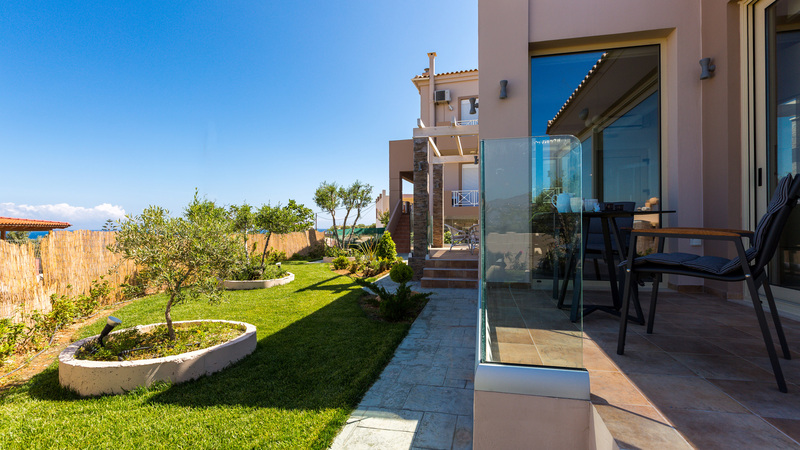 Fully equipped villa containing 2 independent buildings that can be booked only as one! 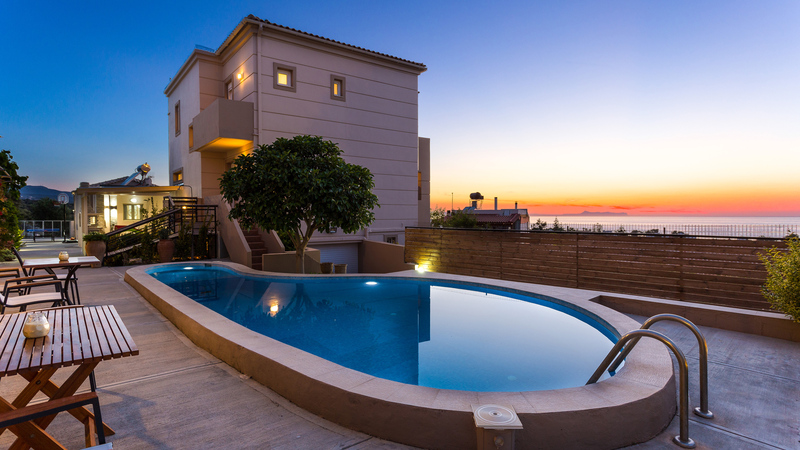 It offers an exquisite sea view, a wonderful sunset and it's a perfect destination for quiet and relaxing vacations! 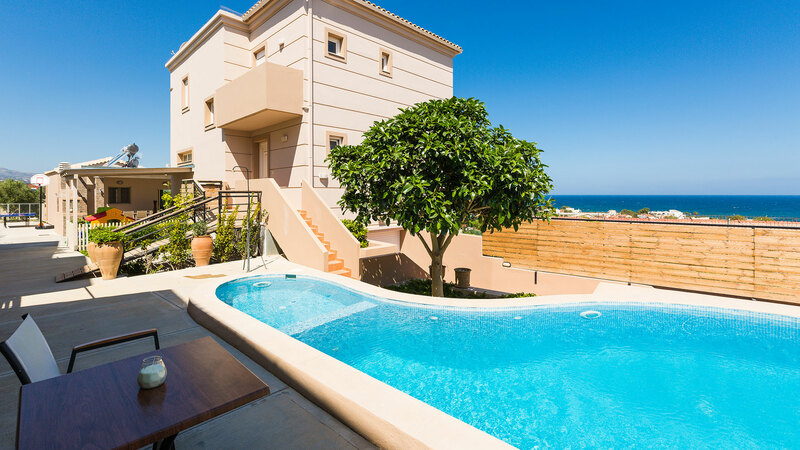 Fully equipped villa containing 2 independent buildings that can be booked only as one! 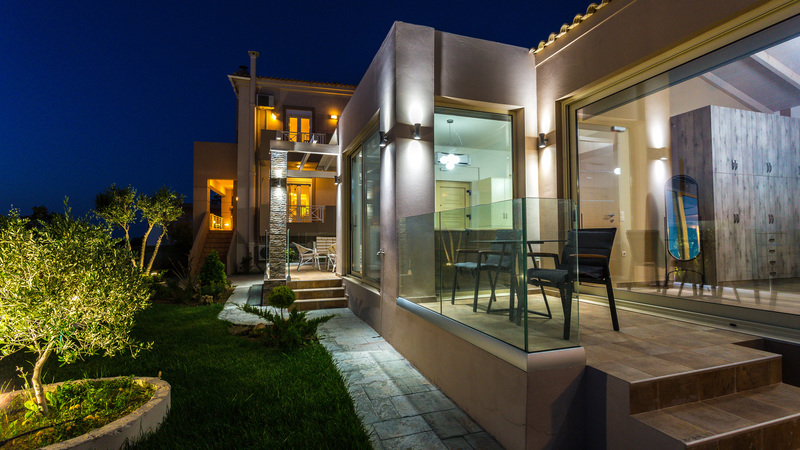 Villa Kokkinos is a 200 m² villa that consists of two buildings next to each other offering 4 bedrooms, 2 kitchens, 2 living room areas in total and a spacious outdoor area. 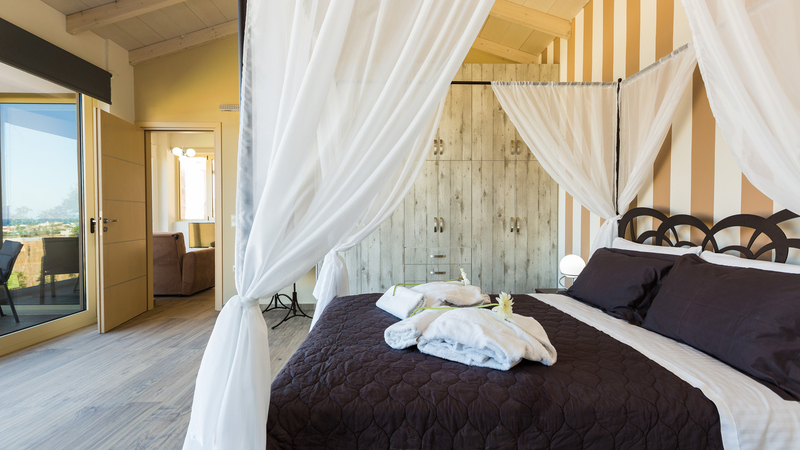 The villa can accommodate up to 8 people in beds and up to 10 people if necessary. The main building is a 140 m² two storey house and the other one is a 60 m² one storey independent studio. 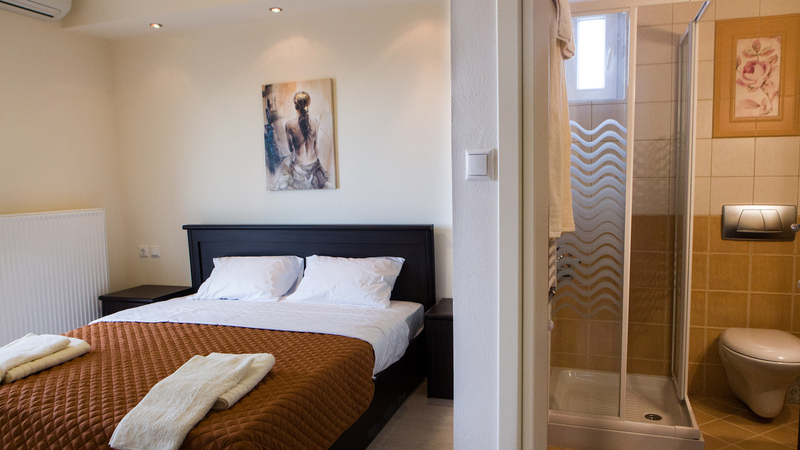 The villa contains all facilities that you might need for your vacations. 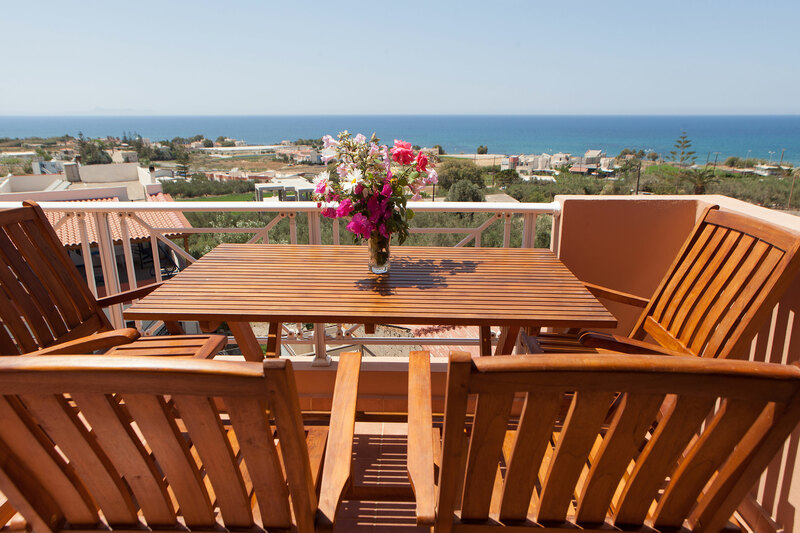 The villa is located in a living area called “Sfakaki”, only 5 km away from “Platanias” area and 9 km from Rethymno city. 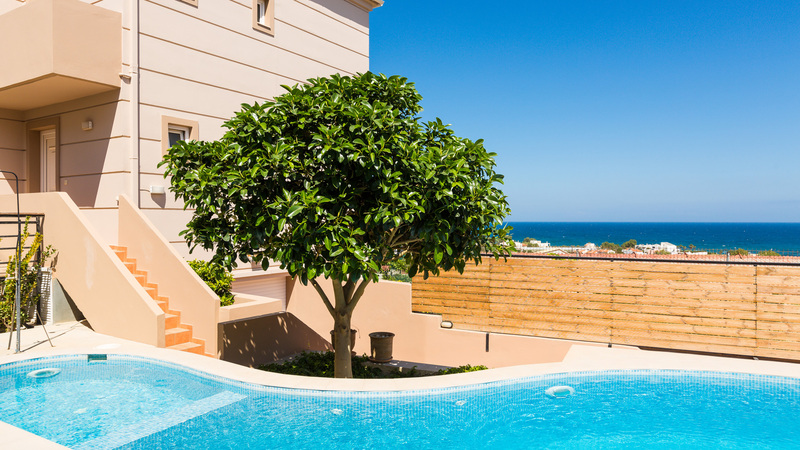 The long sandy beach of Rethymno lies only 1 km away from the villa! 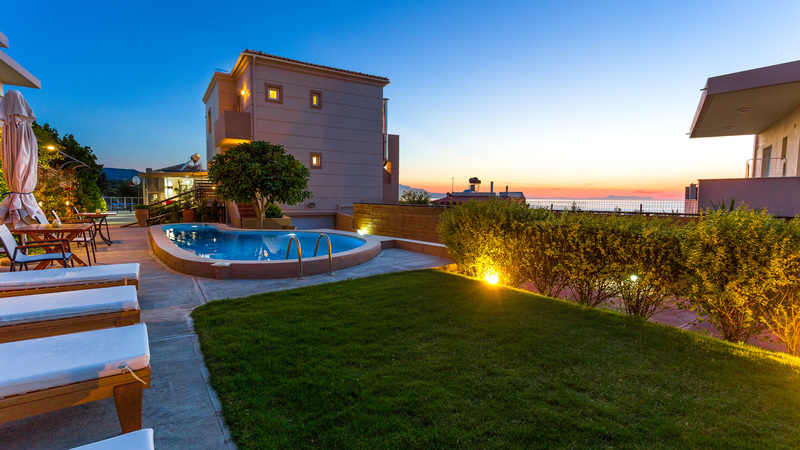 It offers an exquisite sea view, a wonderful sunset and it's a perfect destination for quiet and relaxing vacations. 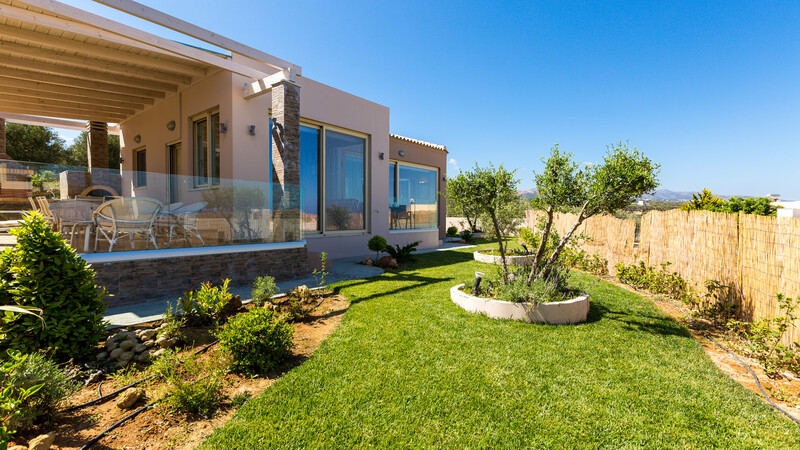 There is a lovely garden with swimming pool where you can enjoy the Greek sun and the Cretan beautiful nature. 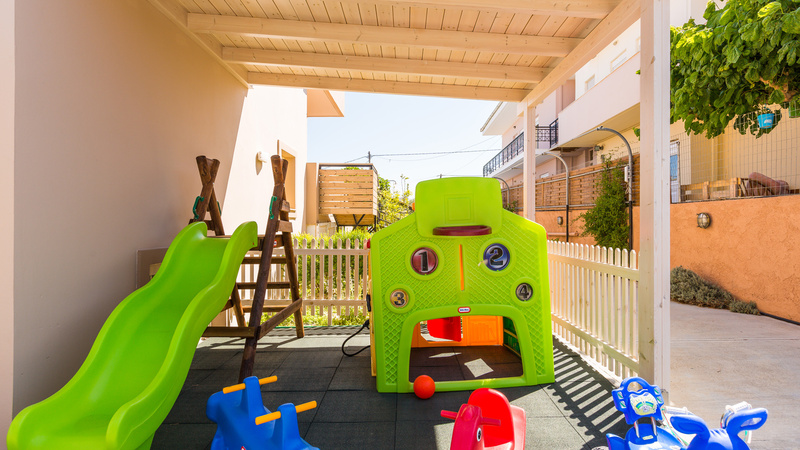 Additionally there are great outdoor facilities that will keep entertained both children and grownups. 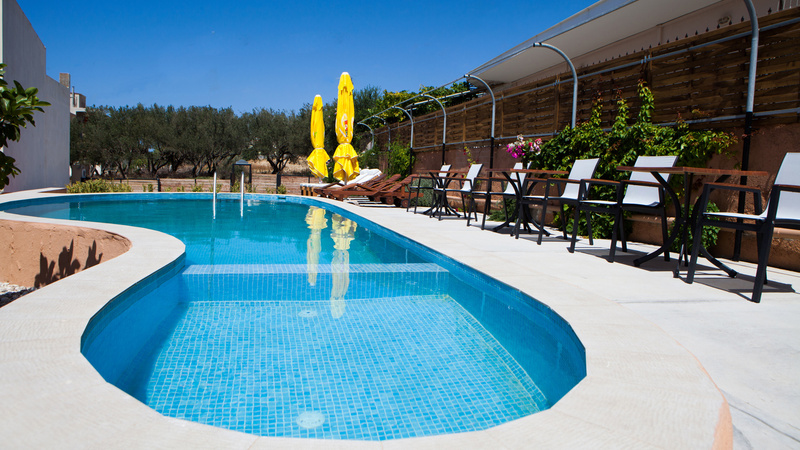 Since its great location, our villa is an excellent starting point for day excursions. On the ground floor you will find the living room which provides a complete entertainment area, as the TV corner has a DVD player, a satellite TV, Wi-Fi internet access and a fireplace which makes the house an appealing winter destination as well. 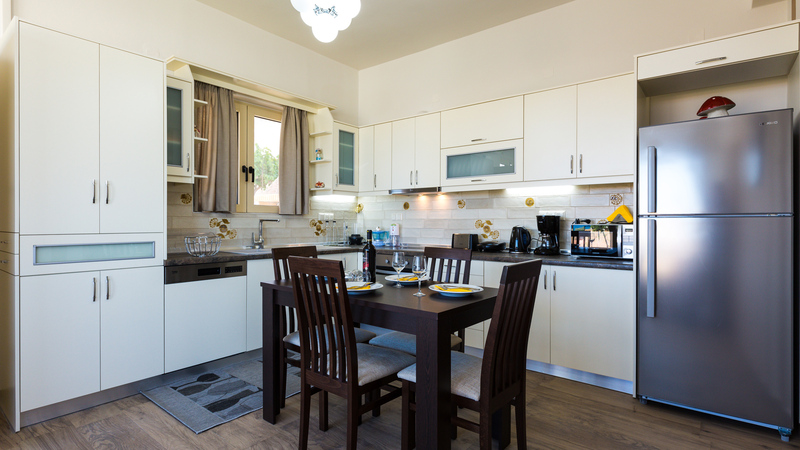 On the same floor, there is the dining area with a big table which is comfortable for all guests, one W/C and an open plan fully equipped kitchen with all the essentials, such as electric oven, microwave, fridge and freezer, dishwasher, coffee machine and toaster. An indoor marble staircase leads you to the first floor, where you can find 3 bedrooms with double beds and 2 bathrooms, one with a bathtub and shower and the other one with a shower. 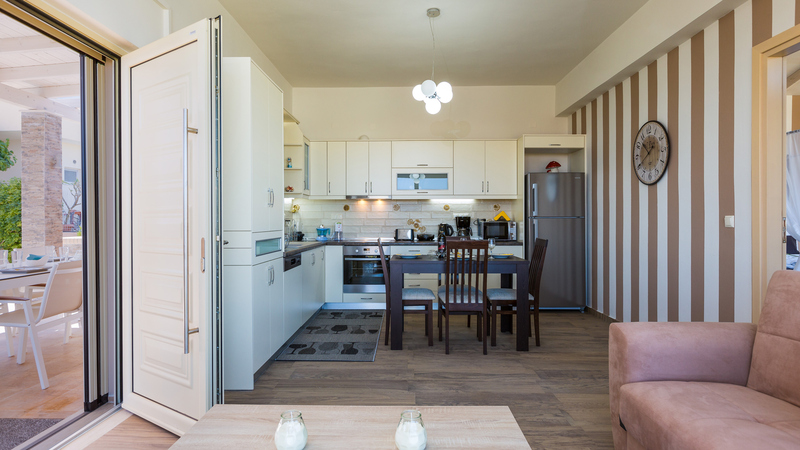 Entering the studio you will find an open plan area that contains a living room area with a HDTV, a fully equipped kitchen and a dining area. 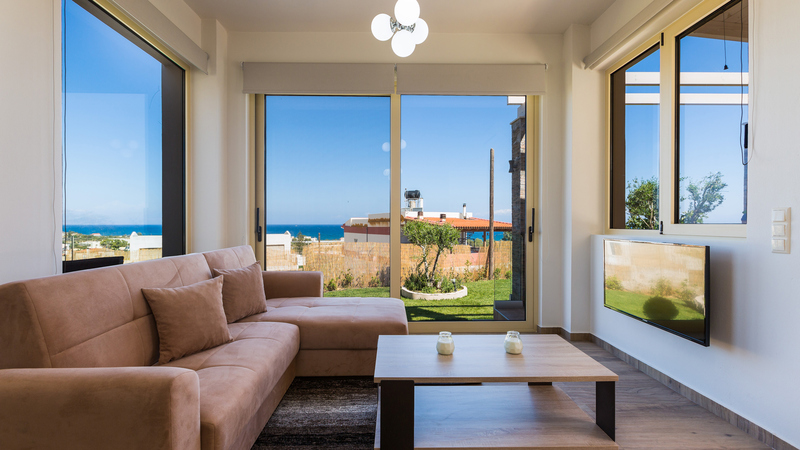 From the whole open plan area you will have the opportunity to enjoy spectacular sea views since there are big sliding glass doors that also lead to the outdoor area. Next to the living room there is a bedroom with direct views to the sea. 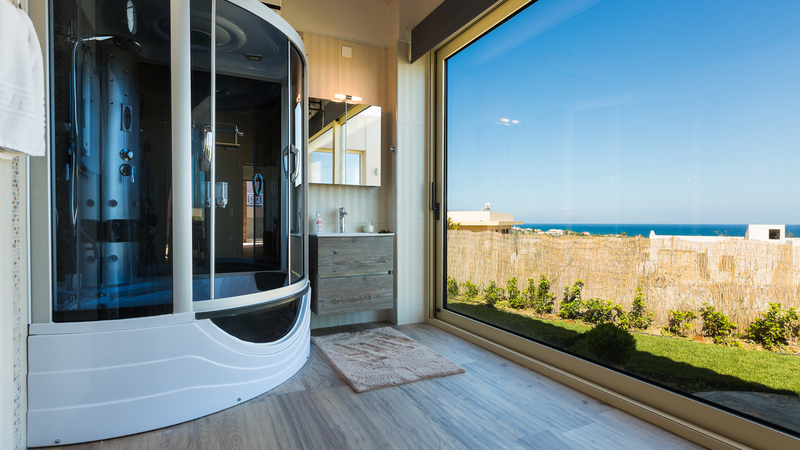 The bedroom consists of a double bed, a big closet, a hydromassage cabin and an en-suite bathroom with shower and a washing machine. 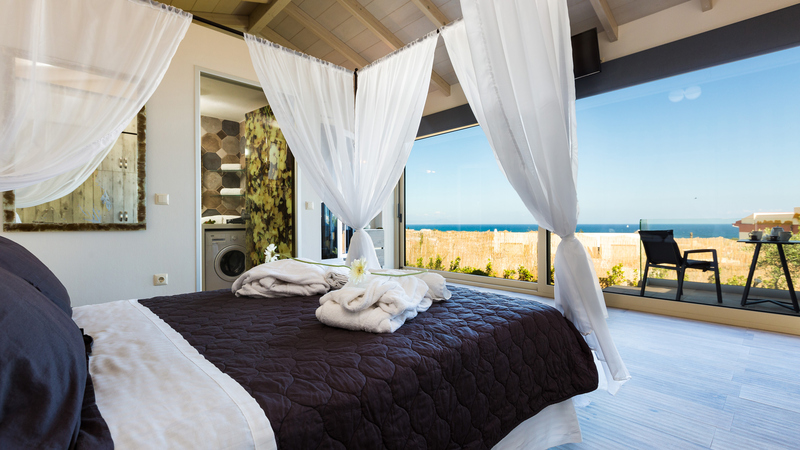 This bedroom is very special and unique as it has big sliding glass doors offering you the chance to luxuriate magic sea view every single moment of day and night. 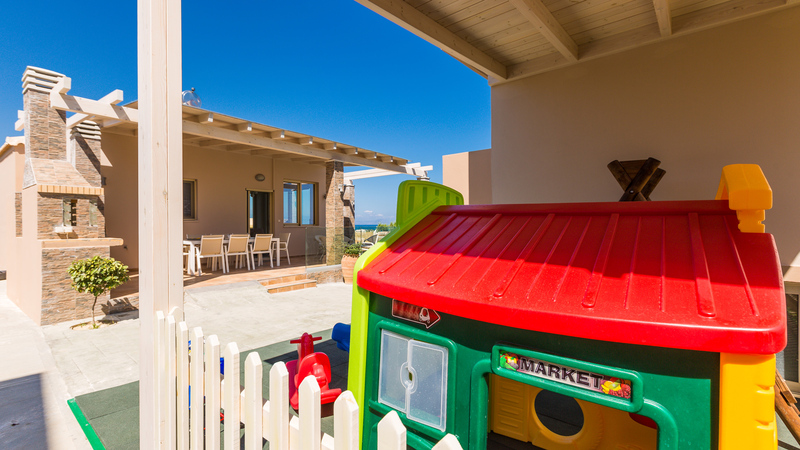 On the outside, there is a well-fenced yard with flower gardens, a swimming pool, hot tub, a playground for children, a basket for basketball, a ping pong table, a dart board, 4 bicycles and a parking lot for up to 3 cars. 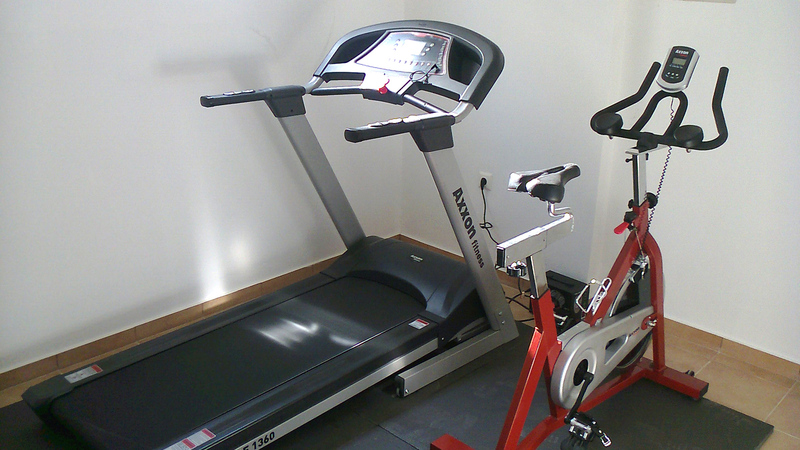 Next to the parking lot you can also find a room with gym equipment. 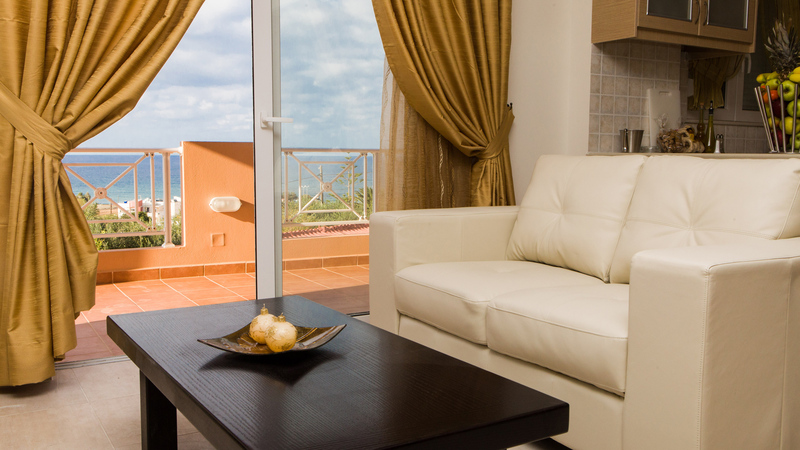 Comfortable sofas, big dining tables and sun-beds guarantee relaxing summer evenings with magical sea views! 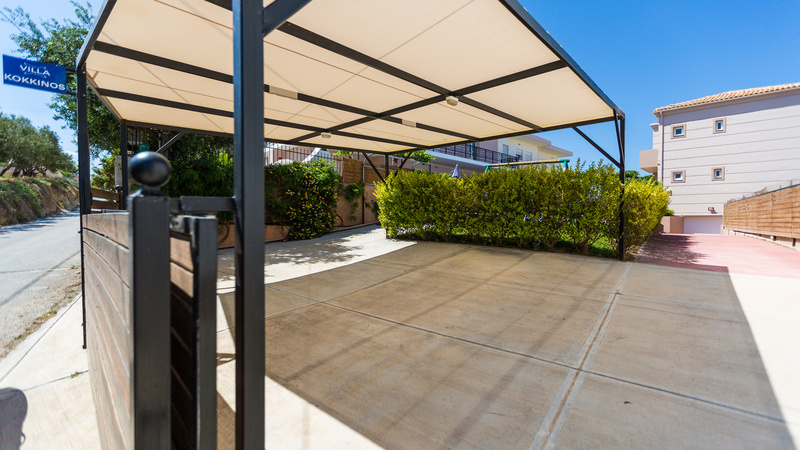 Our rich outdoor facilities ensure you have a pleasant stay. 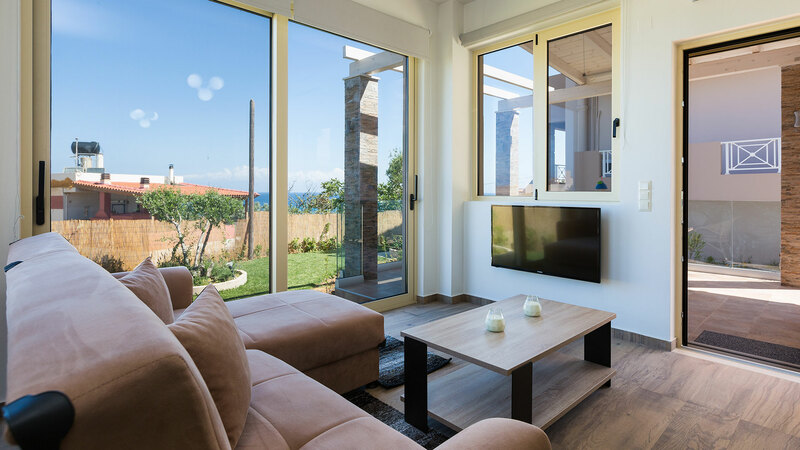 There are two living room areas in the villa, the first one is on the ground floor of the main building and is a spacious open plan area with a satellite HDTV, a fireplace and access to a veranda with barbecue and panoramic sea views. 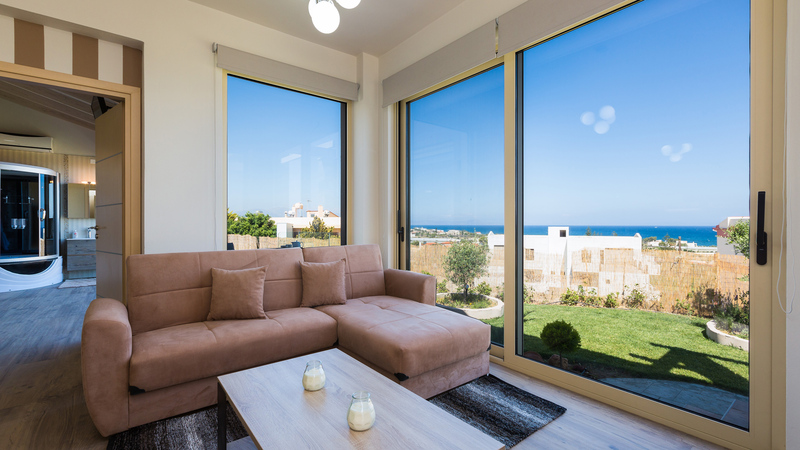 The second one is inside the independent studio and is an open plan area with a HDTV and big sliding glass patio doors that you can enjoy the amazing sea view and also lead you to the garden. In the villa there are two kitchens. 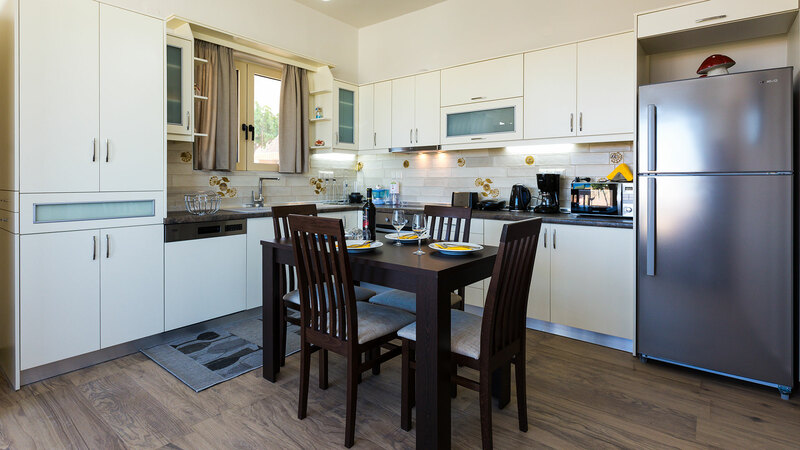 The first kitchen is placed on the ground floor of the main building and it is an open plan fully equipped kitchen with a large refrigerator, a 4 ring stove, an oven, a microwave, a toaster, a filter coffee machine and a dishwasher. 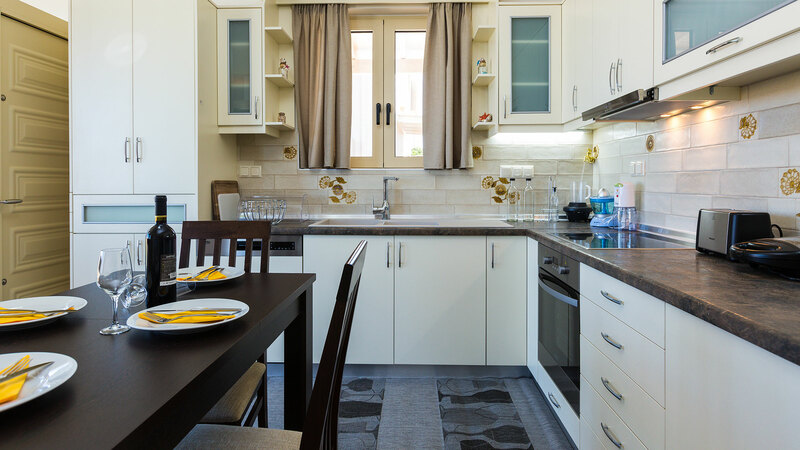 The second one is also an open plan fully equipped kitchen located in the independent studio. There are 3 bathrooms and 1 WC in the villa. 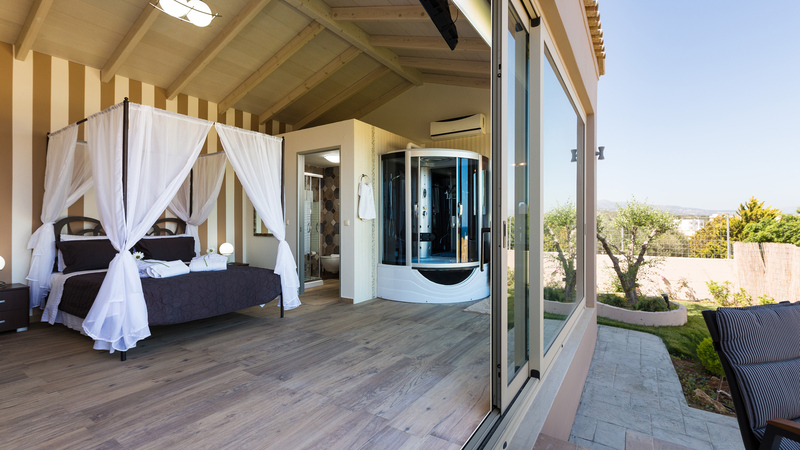 In the main building you will find the WC on the ground floor and 2 bathrooms on the first floor, one with shower enclosure that is en-suite of the main bedroom and the other one with bath and shower. 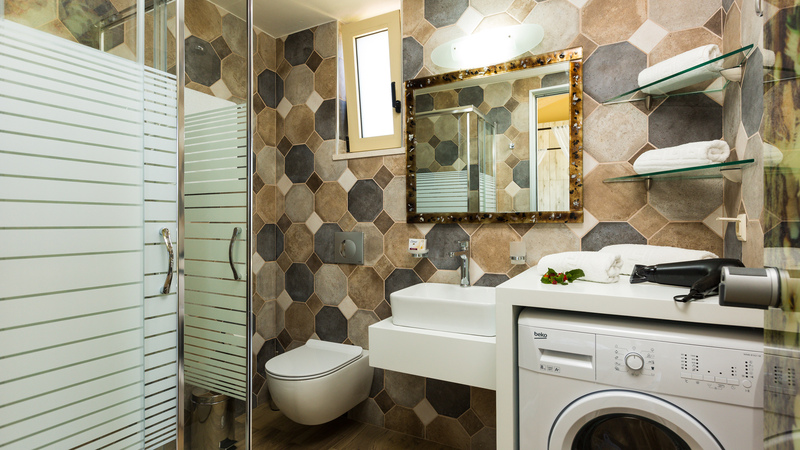 Moreover in the independent studio you will find the third bathroom that contains a shower enclosure. In the outdoor area next to the parking lot you can find a room with gym equipment. Moreover in the outdoor area there are a fenced playground for young children, a basket for basketball, a ping-pong table and a dart board! 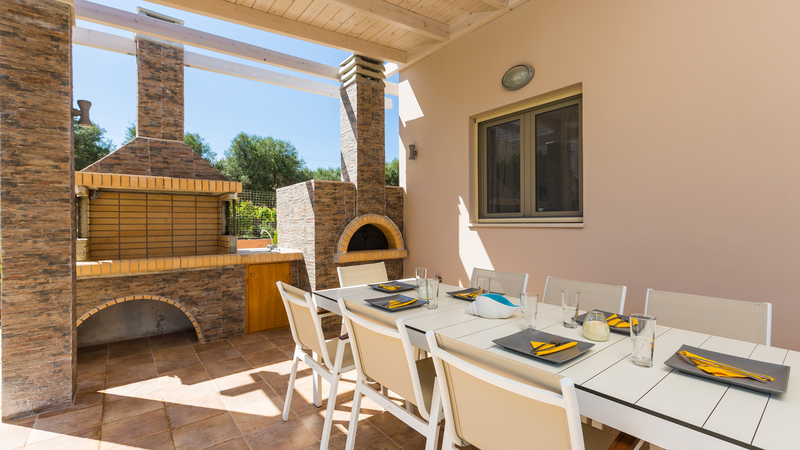 The villa provides two barbecue areas. 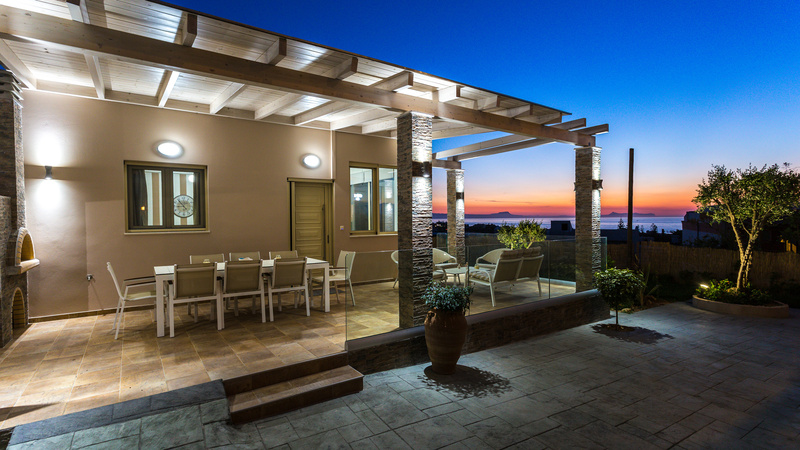 In the balcony of the main building you will find a charcoal barbecue next to the kitchen and in the veranda of the independent studio under a pergola you will find a charcoal barbecue and a wood oven with a dining table. Furthermore, we will provide you with everything you might require such as charcoal. 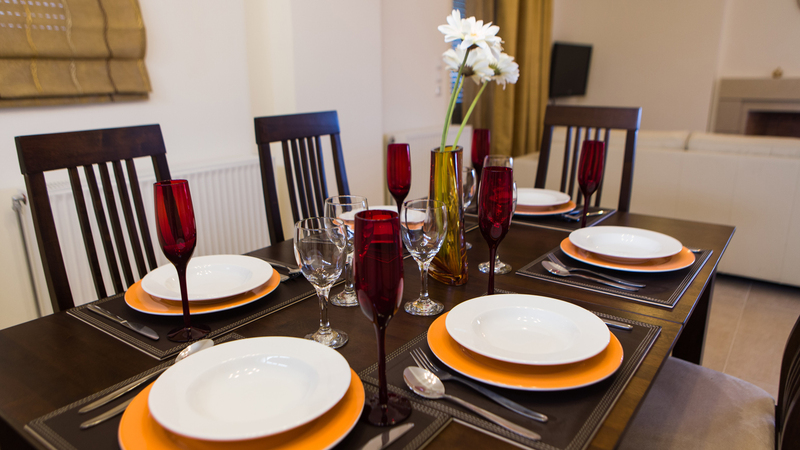 The villa has four dining areas. Two of them are located in the main building, one indoors next to the kitchen and the other in the main balcony next to barbecue. 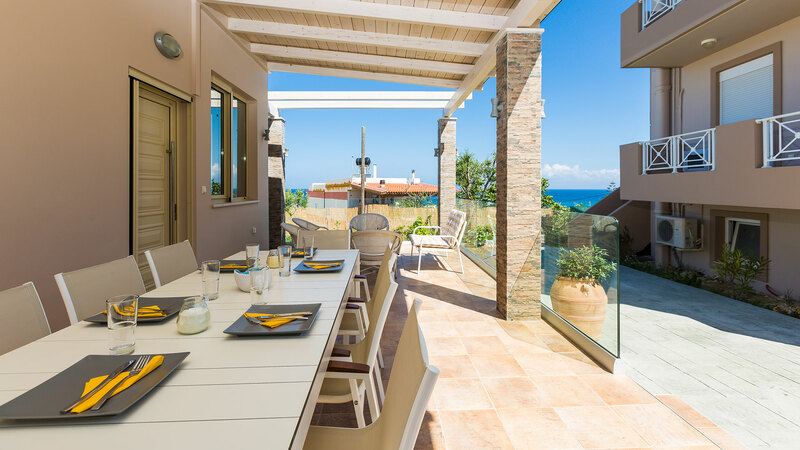 The other two dining areas are located in the studio, one indoors next to the kitchen and the other one in the veranda next to barbecue area.